Along with the delight of seeing your baby grow and develop new skills, every parent experiences anxiety. You watch and wonder, "Is my baby developing normally?" You may be looking at a list of developmental milestones, and worrying whether or not your baby is coming along okay. This article will define what is normal, look at developmental milestones from newborns to 18 months, and then discuss common developmental delays in babies. When thinking about the question, "Is my baby developing normally?" it is important to remember that there is a wide range of development, with many individual routes to a goal. For example, at 9 months, one baby may be doing a lot of weight bearing on her legs, while another baby may avoid weight-bearing but prefers to roll everywhere. Both babies may still start walking on their first birthdays! On the other hand, it is important to monitor your baby's development for any serious delays. The challenge is, how can we differentiate individual normal variations from those that are cause for concern, and stay calm at the same time? In order to monitor effectively, here is a general list of milestones. Please remember that all milestones below have been simplified to provide easy "mental markers;" however, there is a wide variation of normal range that is not indicated below, but must be taken into account. • Language: have different vocalizations for pain, hunger, and pleasure. • Motor: lift her head while prone. Her hands are mostly in fists. • Social: focus on an object and follow it for a bit with her eyes. • Motor: hold his head up 90 degrees (from prone position). He is beginning to put his hands together, and to bat at objects. He is just beginning to bring objects to his mouth, but he does not yet have a refined grasp. • Social: spontaneously smile at you. • Language: start saying nonspecific "bababa" and "dadada", and produce one or more vowel sounds. • Motor: roll over from stomach to back. She can bear some weight on her legs, push up on extended arms in a prone position, pull to sit without head lag, and sit with support. She easily reaches for objects. She should be actively using her thumb rather than having it tucked into her palm. She can rake a Cheerio with her fingers and get it into her mouth, but doesn't have a pincer grasp yet. She enjoys exploring objects in her environment with her eyes, hands, and mouth. • Social: laugh (starts at 4 months). She should make good eye contact and smile interactively. She may play peek-a-boo. Stranger anxiety may be beginning. • Language: understand simple commands, imitate sounds, and respond to his name. He can use voice inflections to indicate in baby-talk if he has a question or is making statement. • Motor: sit independently, get to sitting, and stand while holding on. He can bang two cubes together, and grasp objects using his thumb and fingers. He can find an object that he has watched you hide. He can transfer an object from hand to hand. • Social: show stranger anxiety. • Language: have said her first word, and use "mama" and "dada" to refer to her parents (although often mixing them up!). She can respond to spoken requests to identify some familiar objects ("where's the doll?"). If your one-year-old is very quiet and you don't hear a variety of consonant-vowel sound productions (mama, dada, baba), please request a hearing test. • Motor: crawl on her hands and knees ("creeping"). She may begin walking. She has a neat pincer grasp, using her thumb and fingertip, and can feed herself foods using her fingers. She can release an object, such as a cube, into a cup. She begins creeping upstairs. Most one-year-olds can pull themselves to stand and lower themselves to sit. • Social: indicate wants without crying, using pointing or verbalization. She is likely experiencing separation anxiety. • Language: use at least 10 words, and point to at least one named body part. By 18 months, a toddler is likely to have 10 to 20 words. Jargoning is the norm: this is when he speaks in what sounds like sentences, but maybe one word is intelligible ("java-da-ba-go-baba-mama."). He is following verbal directions given without gestures ("go get the ball", without your pointing or looking at it). He can indicate 3 body parts, either on himself or you or a doll ("where is Mommy's nose?"). He is using sounds to get your attention. If your baby has not said his first word, please request an evaluation from your pediatrician. • Motor: walk backward, scribble, and feed himself with a spoon without much spilling. He can build a tower of two cubes. If your baby is not walking, please request an evaluation from your pediatrician. • Social: throw a temper tantrum! He wants to share, but is ambivalent about it. His separation anxiety may be peaking. He begins to imitate others in his play, and may show symbolic play ("pretending"). He is learning how to take turns. He should respond to his name, and be able to name someone familiar to him. What should you do if your baby is not doing some of the activities listed above? First: don't panic; this does NOT automatically mean that something is wrong. Sometimes, parents are embarrassed or hesitant to bring their concerns to the attention of their pediatrician. Please, don't be afraid to ask for an evaluation. At best, you will be reassured. If a delay is identified, you have done your baby a favor in getting early intervention. Parents should be proactive in requesting regular developmental screening. If your pediatrician prefers not to do the actual screening, ask for a referral to someone who does developmental screening routinely. What if it turns out that your child does have a delay? Early intervention is key. You may be wondering what can be done. This of course varies according to the delay. In general, a therapist will show you ways to work with your child to help him in the area of the delay. A good therapist will empower parents to help the baby learn the necessary skills. 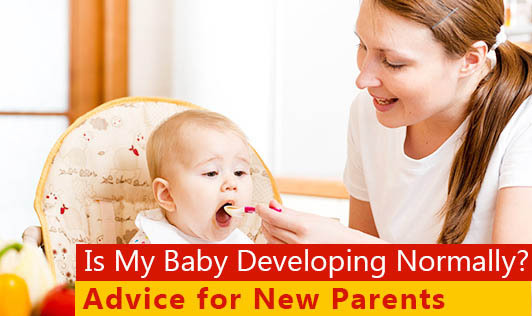 There are usually many things that you can do as part of your daily activity with the baby. Whatever your doubts or concerns are, you need to remember that you are the best expert on your child. And if you are not satisfied or convinced by one professional's opinion, keep exploring. Sometimes your child's challenges or behaviors are not as evident to others as they are to you. Your pediatrician is an excellent resource. Or, you can contact your local school district, or your local health department, either of which can tell you how to receive a free screening. So, please don't hesitate to have your concerns evaluated. Regular screening and early intervention are the best ways to maximize your child's development and functioning.